RSRP developed the Radiation Sources Database (RASOD) in 2003 to support the development of Radiation Sources National Registries. 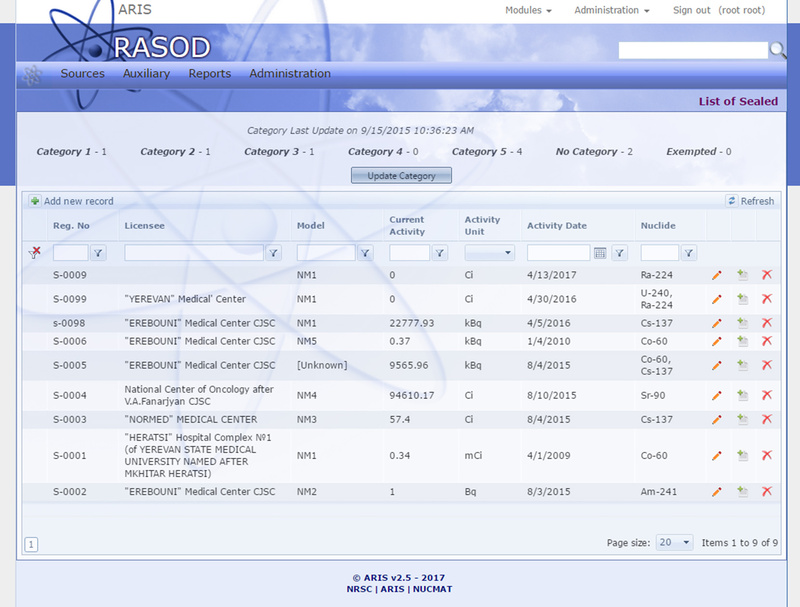 RASOD contains data on radiation sources and links to facilities. including historical data that tracks disposition of the source during its life time from one facility to another It contains data on sealed sources and associated devices, unsealed sources and x-ray generators. The sources information covers among other, source identification, isotope, initial and current activity. The sources category is user assigned or is calculated in accordance with IAEA classification (Categories 1-5). RASOD has flexible reporting capability in Word and pdf formats where all data could be included in the output report depending on the user requirements. The program was developed and is supported by N&RSC that provides continued user community currently in 16 countries.